'Our children are our future, but their well-being IN OUR SOCIETY continues to decline. The health and safety of our children is EVERYONE'S RESPONSIBILITY. at North Eugene High School in Eugene, Oregon. 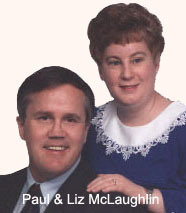 The purpose of this web site, which began after Paul McLaughlin got his first computer in 1994, is to show what one handicapped survivor has done in the community for the prevention and awareness of child abuse. Paul's goal is not to be a victim, not to abuse self, and not to abuse the community by negative revenge, but to speak out about child abuse and also to work in the communities to heal himself and to educate people about the ‘before/during/after' effects of abuse. children's services agencies are present to answer difficult questions. He's the one who delivers hope. Others have benefited from funds he has raised for child abuse programs. in the legislature, in the media, and in local communities. "I want to let people who were abused as children know that they have choices other than to continue to be victims or perpetrators." Not only does he speak out against child abuse, but he also puts his and other survivors words into action in the community. Because of his suffering, he did not abuse himself or the society by doing gangs, drugs, alcohol, or disrespecting his parents. 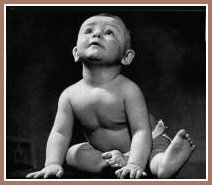 This web site celebrates the triumph of one man over a childhood during which he and his twin sister were tormented and severely abused for eighteen years. 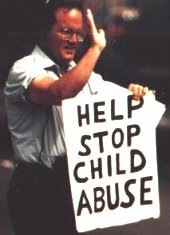 As a precious little boy he came close to death twice, but Paul McLaughlin survived, and has been a tireless crusader for the rights of children and against child abuse since 1975. He began his life's work in his home town of Donora, Pennsylvania. Today, he and his wife Liz live in Eugene, Oregon, where they continue to fight for the right of children everywhere to live free from fear and abuse. to the memory of Thomas McLaughlin, Paul's brother. - Eugene Register-Guard articles about Paul and people in the community. Worth more than words could ever express. - Paul's story as told by writer Eric Mortonson. Minneapolis, Minnesota, another survivor, shares her story. Mint Green Ribbon, stories of abuse, statistics, poems, and much more. Please note that response may be sporadic due to my health. Visitors can instantly send a personal recommendation to their friends and there's a good chance their friends will visit because the message came from somebody they know and trust, not some evil, anonymous spammer. You can have Refer Me up and running within ten minutes, then you don't need to lift a finger to maintain it, just sit back and watch the extra traffic come rolling in. Refer Me is FREE and there are no volume restrictions. However, Refer Me PRO has many kewl extra features! Copyright (c)1975, 1993-2001 Paul M. McLaughlin, All Rights Reserved. commercial purpose without the express written consent of the author. Permission is granted for use by any student for educational purposes or research.